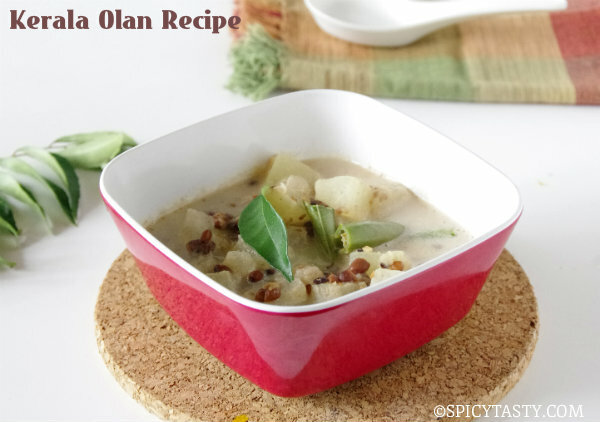 As the name indicates this is a spicy dish which is a perfect combination with roti or pulao or ghee rice. I wanted to try a different version of mushroom curry. So I mixed up a couple of different recipes and tried this dish and it turned it out so good. My husband (GS) and I liked it so much. I used baby bella mushrooms which is my favorite. 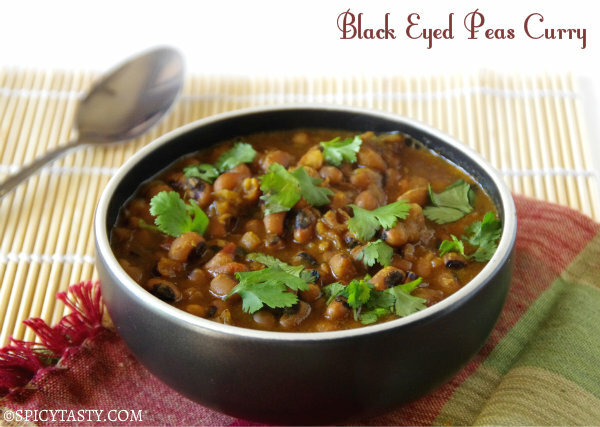 Try this dish and let me know how it turns out. Heat a tsp oil in a pan and add chopped onions and saute until translucent. Grind ginger, garlic and dried chilies with little water to a paste and add it to the sauted onions. Cook for a couple of minutes and add chopped tomatoes and cook until tomatoes are mashed. Let the mixture cool and grind to paste. Dry roast coriander seeds, cumin seeds, fennel seeds and pepper corns. Do not burn them. Pulse it for 3 to 4 times to form a coarse mixture. Heat a tsp of oil in the previously used pan and add sliced mushroom and along with chopped jalapenos and saute until mushroom is tender. Transfer it to a plate. Heat the remaining oil in the same pan and add ground onion tomato paste. When it starts bubbling, add coriander cumin powder, turmeric powder, chili powder, garam masala, chicken masala and salt. Let it cook for 3 to 4 minutes over medium high heat and then add sauted mushroom and some water. Mix well. Let it cook for 10 minutes stirring occasionally. Oil will start separating. 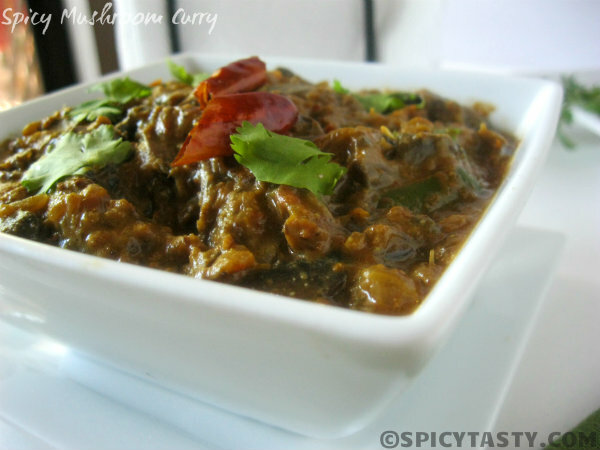 Grind soaked cashew nut to a fine paste and add it to the gravy and cook for another 5 minutes. Turn off heat and serve with roti or ghee rice or pulao. Check out the other popular mushroom recipes in our site: Mushroom masala, Mushroom biryani, Mushroom Dry Curry, Pepper mushroom fry, etc. Wow. What a PILE of flavor. 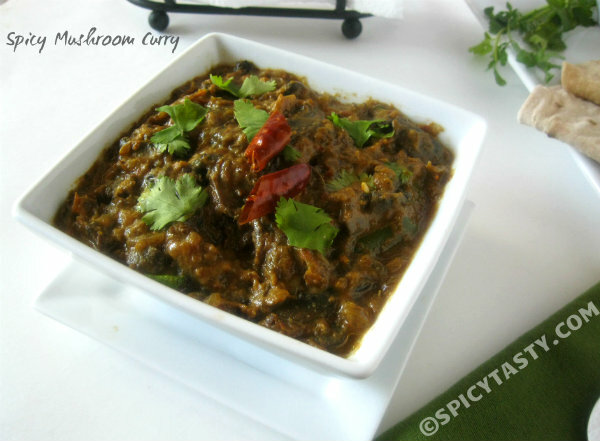 Looking for ideas for a mushroom curry; I’ll start with this. Thanks! your recipe luks mouth watering. However, i have a question, when you say 3 pods of garlic,do u mean 3 cloves of garlic or the whole big pod? Thanks. It is 3 garlic cloves.